Imagine your children going to the playground – your son and daughter to be exact. Because of innate behaviors, they’re fascinated by different things so therefore when they arrive, they chase their own imaginations independently. Your daughter on the swings and your son chasing imaginary monsters with a toy gun. Imagine the winter breeze snuggling against their cold skins and their childish refusal to end their treasure hunts in their world because fun is where they find solace. Imagine your son in his own little world playing with his toy gun and respectfully not pointing it at anyone. But someone is afraid. A bystander sees the child playing with a gun and decides to call the law – the right thing to do when in fear. Imagine you being the adult and reassuring the dispatchers the gun is most likely fake but just to be on the safe side. Imagine the boy, with his toy gun in his waistband – talking to his imaginary friends about his fun. And as he stands and begins to walk away, imagine these officers driving up to him and in the 2 seconds of arriving, your son being shot in the stomach. And imagine your daughter – whose imagination abruptly shudders away from the sounds of gun shots. And with the help of sisterly love, she sees the victim is her brother and she runs – she runs to protect and care for him. Yet, imagine when she approaches she is tackled and handcuffed and put into a police car. Imagine your daughter, sitting and crying and watching her brother toss on the ground in agony as his life cries from him.Imagine his cries and her cries – of innocence. Imagine that being your last memory of your son and the wailing from your soul from knowing your baby is gone. 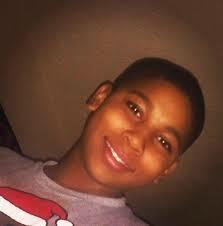 Imagine ….Tamir Rice could be your son.